It's #WarhammerWednesday time here at Cubicle 7 and that means another super WFRP post from C7 writer Ben Scerri! This week its all about Creatures! Let us know on Facebook and Twitter how you create Creatures for your games — and definitely regale us with stories of your own twisted creations! If you missed Ben's previous posts, settle in and catch up on post one, two, three and four now. It’s that time again! Hey folks, I’m Ben Scerri, and I am Excited™ to jump back on my soapbox and wax lyrical about all things WFRP! 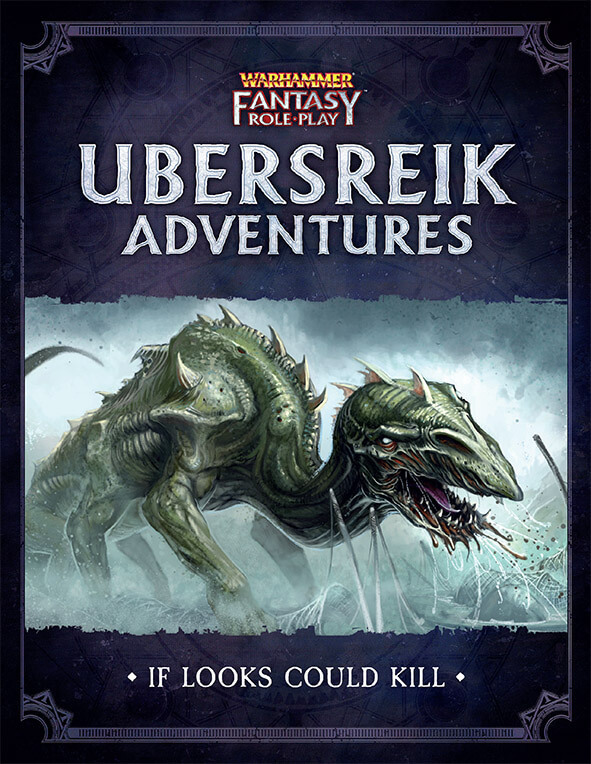 This time around, I’m going to poke my head into the Bestiary, and I’ll explain the various methods I used to create Creatures for every WFRP occasion. Let’s begin! Creatures are, by design, very simple things in 4th Edition — a handful of stats and a few Traits. What really makes the monster is the GM’s description… Which means that our first method for making new Creatures is to steal existing ones and changing the way you talk about them! Let’s look at the humble Orc: beyond the descriptive text on page 325, we have a Creature with high Toughness, reasonable Weapon Skill, Strength, and Willpower, and pretty much rubbish in everything else. We also have a Creature with strong armour, who doesn’t take orders well, and who has a bad habit of not knowing exactly when to die… This works perfectly for an Orc, but it could also work well for an overly muscled Mutant, or some form of thick-skinned Lustrian ape! A Creature’s Traits bow down to the GM’s description, so instead of seeing Creatures as set-in-stone rules from the book, feel free to give them a fresh coat of paint, and to call an Orc an Ape! Each Creature also comes with a list of Optional Traits they can be given. Again, these aren’t the only Traits they can be given in addition to their normal list, but they are given as suggestions for what makes sense, and might commonly come up. Adding one or more to a Creature among a group of similar Creatures is a great way to mark one out as special — perhaps the leader, or a spellcaster among mundane monsters, and so on. Let’s look back at the Orc. Our options are Painless, Ranged+8 (50), and Size (Large). If there are four Orcs, you could pick one out to be a hulking warboss by making them the biggest (with Size (Large)); one could be a cunning archer, armed with a bow and arrows (with Ranged+8 (50)); one could be a normal, run of the mill Orc; and the last could be a Savage Orc, far from home, painted with the blue warpaint wot-makes-you-not-die (the Painless Trait)! On top of that, all creatures can be given the Generic Traits on page 310. So, maybe an Orc is also a Brute (maybe they are all Brutes! ), maybe one is an Elite (a Black Orc, perhaps), or maybe one is a Leader, or carries a different Weapon (Choppa!). And there's more: remember that the Optional Traits are far from an exhaustive list of what can be given to a Creature. Maybe there is an Orc Shaman (with the Magical and Spellcaster Traits). Maybe there’s a Savage Orc in the mix (with the Frenzy and Ward (9+) Traits). Maybe there’s even a mad Orc Alchemist, covered in vials of deadly poisons and horrible acids (with the Venom and Corrosive Blood Traits)! Alternately, the Menu Method can be used in conjunction with the Paintbrush Method above. This can be done to make Combat easier on the GM — they only have to consult one stat block, but can describe many different kinds of monsters — or to create new Creatures with very little work. With the Menu Method, you can pick and choose from the Traits list (or even invent your own) to quickly generate drastically different Creatures at the drop of a hat! Suggest we took away the Orc’s Belligerent Trait, and gave it the Cunning Trait instead. Now let’s take the Night Vision Trait, and replace it with Breath 2 (Electricity), and lastly we replace Infected with Daemonic 8+. What started out as a mundane member of the Greenskin species, with three little changes, has become a terrible new foe in the daemonic armies of the Chaos Gods! What’s more, we can just change numbers around if we feel like it. Swap the template’s Strength and Toughness around to make it a harder hitter, but letting it go down easier. Swap the Willpower with the Fellowship to create a beguiling soldier for the Prince of Excess, or perhaps with Intelligence and Initiative to make a scheming hawk-eyed Tzeentchian terror! When you combine these sorts of changes with liberal use of colourful description (as in the Paintbrush Method above), your Players will never know the awful thing they face started out as an everyday Orc, a few moments before the session began. Which brings us to the last method for making Creatures: the Career Method. This one is a little more involved, but worthwhile if the Creature is going to be a recurring villain, or if you want to build something that really challenges the Characters. To do it, you simply treat a Creature like a Character — pick one, pick a Career, and start giving them Advances! Make your Orc a Pit Fighter. Have your Orcs marshall together as elite Black Orcs by taking several Careers along the Soldier path! These Careers don’t even need to make sense, at first. Consider sending your Orc Shaman to college as a Wizard! Maybe they stumbled on an ancient book of arcane lore, and learned far more than is right! Maybe they have been corrupted by a terrible artefact, and have a bunch of advances in the Witch Career, as well. Creatures can take Skills and Talents just like any Character can, so feel free to go all out. Give them as much XP as you feel is necessary — maybe 500 or 1000 for a challenging Creature for new Characters — and then grant them more XP as the sessions go past. Hell, you could frame entire adventures around preventing new knowledge from falling into the hands of a monstrous force of Creatures: if the Characters succeed, their foes remain ignorant, but if they fail, the Orcs all learn the Drilled Talent! If you really wanted to go deep down this rabbit hole, you might even consider giving Creatures a few Endeavours whenever the Characters get them...but that’s an article for another day. As you can see, you can get as involved in the process of making new Creatures as you want. You can make a whole new Trait, or just pick from the selection given to you, throw a few darts at a board and see what sticks, or finely craft a nemesis for the Characters who will last until the final adventure… But really, the biggest thing you can do is to switch up your descriptions. Imagine the most terrible, brutal, profane, awful, nightmarish, hellish, repugnant, obscene, macabre, malevolent things your mind can conjure, and enjoy the looks on your Players’ faces when you call for Initiative! Don't forget to let us know on our social media channels how you like to create Creatures for your games, links are at the top of the post!